A matrix which exclusively consists of zeroes except the principal diagonal, is called a diagonal matrix. It is usually denoted by diag(a11, a22, ..., ann). 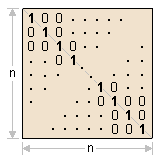 The matrix diag(1, 1,..., 1) with n 1s is called the identity matrix of order n.
We denote the identity matrix of order n by I, or if the order is relevant, by In.